Mac users are still waiting for Mac OS X 10.7 Lion release date info, Apple’s latest software update for Mac computers. 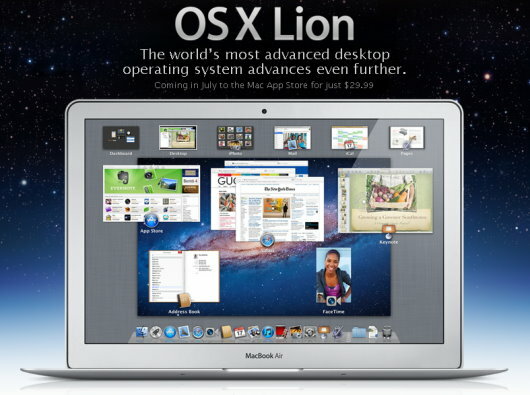 The Cupertino technology company announced beta version of Mac OS X Lion at its Worldwide Developer Conference 2011. Official version of the software update has not yet hit the market, though it was expected to come out of furnace by half of this month. The company unveiled Gold Master (GM) build of Mac OS X Lion on July 1, raising the speculation that Apple will roll out the official release on July 14. Apple used to keep a distance of 14 days between GM and official release in case of its Mac software updates. As well, a coincidence or not, Apple released all versions of its Mac OS on Fridays. Therefore some people expected the official software release would happen on July 15. Both the days are gone. Apple has not yet revealed anything about the release date of Mac OS X 10.7 Lion. The new version of the software will introduce a set of amazing features, Apple CEO Steve Jobs said while presenting the beta version at WWDC 2011. FaceTime video chat, auto-save, multitouch gesture, AirDrop and iCloud are the key features Mac OS X Lion is supposed to highlight over its previous version, Mac OS X 10.6 Snow Leopard.